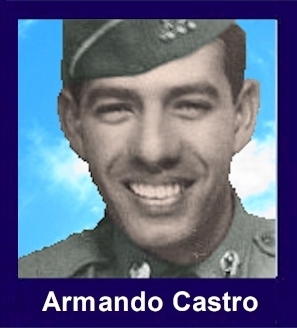 The 35th Infantry Regiment Association salutes our fallen brother, CPL Armando Castro, US56130482, who died in the service of his country on June 2nd, 1953 in North Korea. The cause of death was listed as KIA. He was from San Francisco, California. Armando's Military Occupation Specialty was 1745-Light Weapons Infantry Leader. The decorations earned by CPL Armando Castro include: the Combat Infantryman Badge, the Bronze Star, the Purple Heart, the National Defense Service Medal, the Korean Service Medal, the United Nations Korea Service Medal, and the Republic of Korea War Service Medal. My father was KIA June 2nd 1953. He was in U.S. Army, Company F, 35th Infantry Regiment, 25th Infantry Division. I was only 22 days old at the time of his death and my life and my mothers life has never been the same since that day in June. I will forever feel the emptiness of not having a Father in my life and now not having a Grandfather for my children. Although I never met you Dad, I will always be your little girl and I will always love you. May God bless everyone who served and everyone who like me still lives with the pain of loosing someone you love.